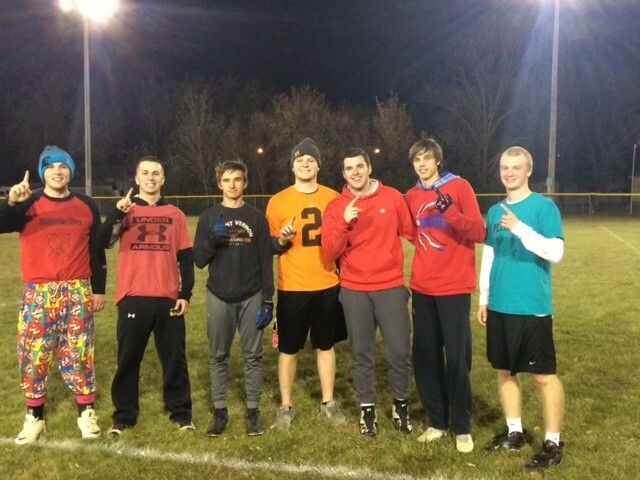 The Intramural Flag Football team had their final games of the season on Wednesday, Oct. 24. These games took place at Flynn Field at 6 P.M. There were two games that played that day with one team playing back to back games. The team names are based off the respective flag color. In the first game with the Blue team against the Yellow team. They played a five-man instead of seven-man because the Blue team didn’t have enough players for a seven-man game. 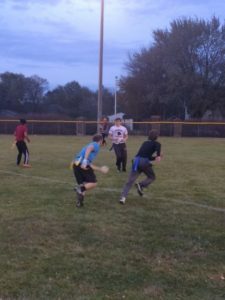 The game was back and forth where each team would score then get a two-point conversion. It was until the blue team stopped team Yellow’s two-point conversion before the end of the half that is was tied. After half-time, it came back to intense playing on both sides where they would stop the opponent’s push. At the end of the game, the Blue team came out victorious with only an eight-point lead. The next game was the Red team versus the Yellow team. This game was a seven-man game which became much more chaotic and harder for the quarterback to pass to. The game was very back and forth until the red team intercepted a pass and ran it back for a touchdown. But this didn’t stop the Yellow team as they came back in full force scoring a touchdown in response. The Red team ramped up the tempo of their playing by blitzing and intercepting the passes. By halftime, the score was 35 – 39 the Red team. Once the second half started, the Red team kept pulling away, but the Yellow team was trying to not let them get too far of a lead. The yellow team got two interceptions that both scored which made the game only a few points difference. The game ended with the Red team winning 54 – 59. One of the players on the Red team explained how their season went. He cheerfully said, “That it was a lot of fun playing with these guys. We went undefeated which is a plus.” Afterward, the player promptly got water dumped on him for the team’s victory celebration.